Yes — I had every intention of writing a daily post on New Year’s Day when I started this. And then life kicked in again — mostly in the form of continuing elder care, with yet another string of emergencies, hospitalizations, and relocations, but also with the crazy patchwork of fluctuating part-time jobs which have allowed me to somehow stay afloat for years now and still be able to be primary caregiver for my mother plus our combined zoo of companion animals who are also family. As part of the process of rediscovering myself after putting everyone and everything else first for all too long (anyone else recognize themselves here? ), I decided to journal my journey. Since I am an artist, designer, weaver, teacher, and insatiably curious researcher and reader, my purpose here is also to share the art, the spectrum of interests, and the findings on various topics that friends ask me about repeatedly — without having to constantly repeat myself. In order to keep in touch with friends old and new, I have agreed to satisfy the constant comment that I “should write a book” instead by recording the results of my experiments and explorations, daily bits and pieces, puzzle parts, questions and reflections that come up along the way. I smudged. Typically only think of it and get around to it when I’m moving into a new space ~~~ has just sort of become a clean slate ritual learned during years in New Mexico from the Pueblo Indians north and south of Santa Fe. But I had pruned back the sage pot before moving it inside for the season and wrapped the clippings for a smudge stick, then set it aside to dry and forgot it. 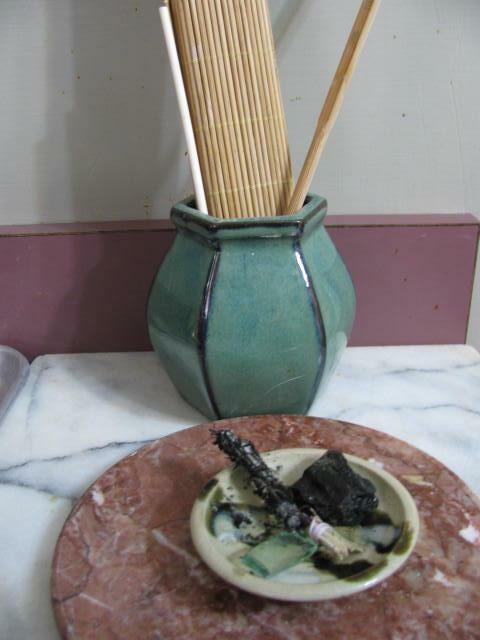 Suddenly rediscovered, during a bout of late night cleaning and New Year’s Eve reorganization, the smudge bundle beckoned me to start the year fresh on a higher level, so I placed it by the front door to remind myself in the morning. After staying up for the nearby fireworks, I needed to get caught up on sleep. In the morning, once I had gotten my cup of green tea and taken care of feeding time at the zoo, I lit the sage and began by smudging myself, top to bottom and up again, front to back, sending wordless prayers and thanks to the heavens. Then I started off around the inside of the house, one room at a time, slowly, contemplatively, opening closet and cabinet doors, including all the contents, as well as the feline housemates, who were fascinated by and fixated upon the curls of smoke wafting around me. Perhaps because this time I was not clearing an empty space (far from it! ), I found myself blessing all the shelves, stacks, and piles — clutter and unfinished projects included — and being amazed at the absolute abundance around me, everywhere I turned. Somehow, all the undone To Do lists and disorganized collections of books, supplies, and tools were instantly transformed; they went from evoking feelings of oppressive overload to feelings of gratitude that I have so much to work with and so much that I can give away to make room for what I want in my life now. Then I walked around the cottage, the gardens, and the storage shed, still sending streams of sage smoke skyward, momentarily wondering if the folks across the creek in the trailerhood wondered what the crazy lady at the museum house was smoking! But again, instead of thinking about needing to clean the shed or weed the gardens, I was simply in awe of my surroundings and the beautiful day. By the time I had completed my leisurely stroll through this part of the planet, the last bits of the smudge stick were still smoking, so I came inside and placed it in a tiny bowl on the kitchen counter along with a piece of weathered glass and a black crystallized stone which had caught my eye during the walkabout. The sage continued its purification magic while I made juice and put together an omelet for breakfast.